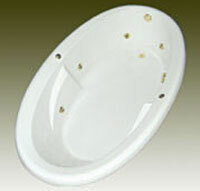 Drop-in oval with integral armrest. Variable speed blower produce powerful air streams for a better massage. A powerful heating element warms the air before it enters the bathing well. 54 strategically positioned perimeter air channels surround the bather with millions of soothing bubbles. 68" x 42" x 20"